Crevecoeur Chickens are an ornamental bird that was originally used as a dual purpose bird in France, but they are now very rare worldwide. Comb, Wattles & Earlobes: They have small wattles and small earlobes that may be concealed by the crest. They have a V-shaped comb. Male: Has a medium-size comb that rests against crest feathers. Female: Comb is very small and possibly concealed by crest feathers. They are all bright red. Color: The beak is black that shades to horn at the tip. The eyes are reddish bay and shanks and toes are dark leaden blue. The plumage is standard black. Special Qualities: It is an ornamental that was originally us as a dual purpose bird in France. This breed is one of the oldest breeds in France. It is named for a town in the province of Normandy. The breed has been documented since the 1700's, though poultry historians think that the breed actually goes back much further than that. It is thought to be one of the ancestors of the La Fleche, which has been documented since the 1500's. 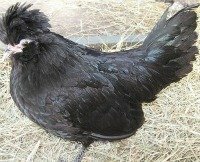 How the breed was originated is unsure, but it is speculated that French breeders bred Polish chickens with the common bird from the French countryside at the time to come up with the breed. They were originally developed as a dual purpose bird. They are a good layer of medium-size white eggs and the hens rarely go broody. They were also considered a fine table bird at the time. The English and American markets preferred light legged birds to the breeds leaden blue and so, the birds were primarily just raised for show in England and North America. The result of this is that the breed now usually weighs less than what is standard weight. The breed is fairly hardy and tolerate confinement, but do seem to often be somewhat standoffish.